The SSL certificate that the file is digitally signed with is not trusted by the OS. Although if you use the same file to install Java on Windows 2003 server it would work fine. To check what is happening with the file right click on it and go into properties. Select Digital Signatures tab and click on Details. The certificate in the signature cannot be verified. Here we can see that the certificate that is used to sign the application is fine but the one above it is not. Here you can see the details about the issuer. 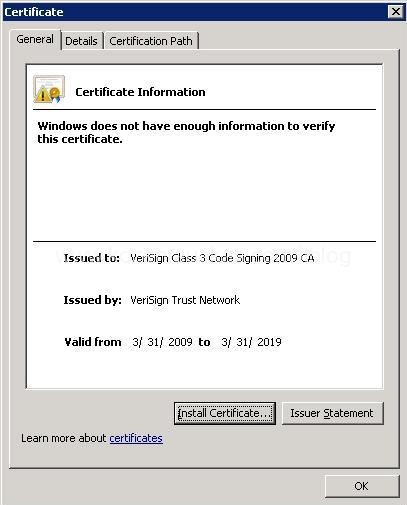 If you check the certificate stores you’ll see that there is no corresponding certificates for this issuer and therefor it is not trusted. 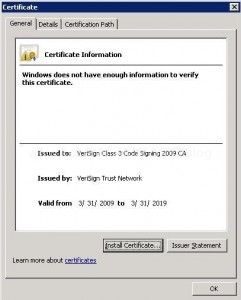 Go to http://www.verisign.com/support/roots.html here you can download all root certificates the one we need is VeriSign Class 3 Public Primary CA – G2 as stated in the image above. 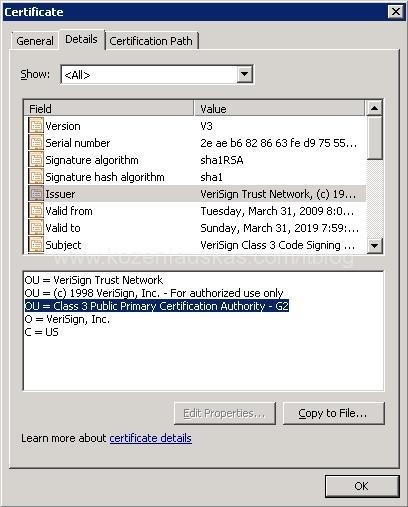 You can download all root certificates from http://www.verisign.com/support/roots.zip or just a PEM file for the specific certificate. 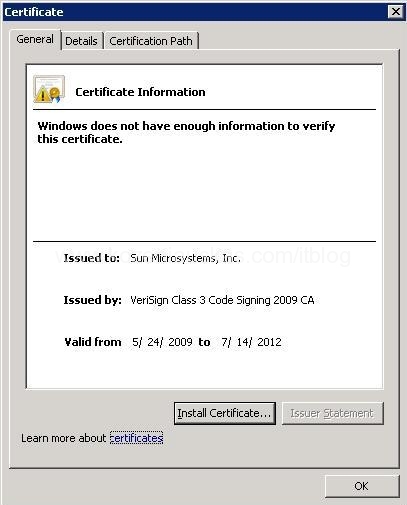 Once downloaded install the certificate and install/import it to Trusted Root Certification Authorities store. If you want to install the certificate under Computer account use MMC console to install the certificate. Thanks so much. I’ve been trying to get installs to work on a virtual PC for days…this was the only place I found that indicated there was a “tree” that needed checking! I’ve saved a link to this page…my users may bump into this same issue some day. Sorry this post was written ages ago. It is suppose to be cab file. Thank you very much , solved my issue, Thanks.